Booking form to be completed and a non-refundable 100.00 deposit paid to secure a reservation with the balance due two weeks prior to arrival. A stay in one of the cosy self-catering riverside log cabins on Old Mill Park gives you the best of all worlds; the park itself is set in a small, secluded and peaceful riverside location but is close to the the bustling harbour town of Barmouth with its lovely pubs, restaurants, beaches and woodland walks. Guests are also welcome to make use of the fabulous club, entertainment and facilities at our nearby sister holiday park and for those who love the great outdoors you can go stand-up-paddle-boarding in Barmouth, on the Zip Wire in Blaenau Ffestiniog, surfing at Surf Snowdonia and there's always the odd mountain to climb! Oak Lodge is the smallest of three cosy riverside log cabins and sleeps x2 in a double bed that's so comfortable you may not want to get out of it! By day it’s light, bright and airy with patio doors opening on to the riverbank where you can breakfast in your pyjamas and watch the ducks float by! In the evenings a log-effect gas fire soon has you warm and cosy if the temperature drops. It's perfect for a honeymoon or couples looking for a romantic relaxing break. 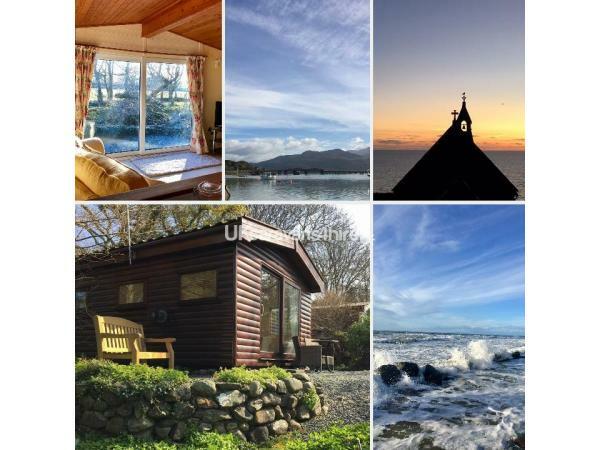 Old Mill Park is in the centre of the village of Talybont, halfway between the coastal towns of Barmouth and Harlech, which has a medieval castle and spectacular views out over the bay. We call it the land of legends; a magical place where the mountains meet the sea with miles of golden sandy beaches, panoramic walks, castles, waterfalls, picturesque villages, friendly pubs and sunsets to rival the most stunning you’ll see anywhere in the world. There are no shopping malls or congested motorways here although we do have 4G and the log cabins are WiFi connected so you can stay in touch, if you must! 1 March and ends 31 October. Prices are from £195.00 for a 3-night break, up to £495.00 for a 7-night stay. Please visit our Facebook page Old Mill Park for more photos and reviews.